In my parlance, a good day is one with clear blue skies and, assuming summer, a warm temperature in the mid-20s centigrade. A quite nice day would be a dry day with scattered cloud and sunny intervals with a consequently slightly lower temperature in, say, the low-20s centigrade. In western Scotland it is necessary to adjust one’s yard stick when it comes to describing the quality of the day. Here, a good day is one with total cloud cover that remains dry all day long and may hit the dizzying heights of 16°C. An exceptional day will include the occasional tiny glimpse of blue which is swallowed by the clouds almost the instant it appears. A quite nice day is one with ten tenths cloud cover and rain for part but not all of the day. After yesterday with close to 24 hours of rain, Francine peered out of Guillaume this morning and, having adjusted her levels of expectation muttered, “it’s quite nice out there now”. Today dawned with solid cloud cover but without rain … as yet. There were even a few fleeting beams of light hitting the opposite side of Loch Linnhe. 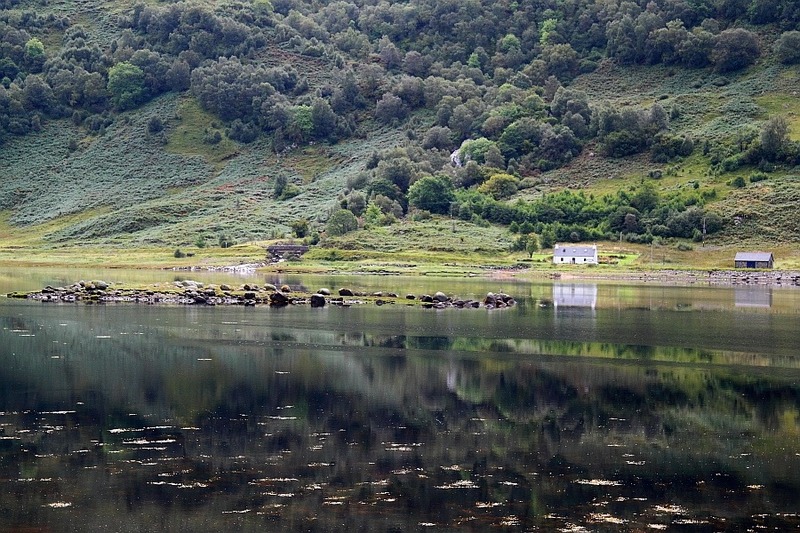 Yes, we could actually see the opposite side of the loch. We decided to investigate those occasional light patches on the Ardnamurchan peninsular, the opposite side of the lock. 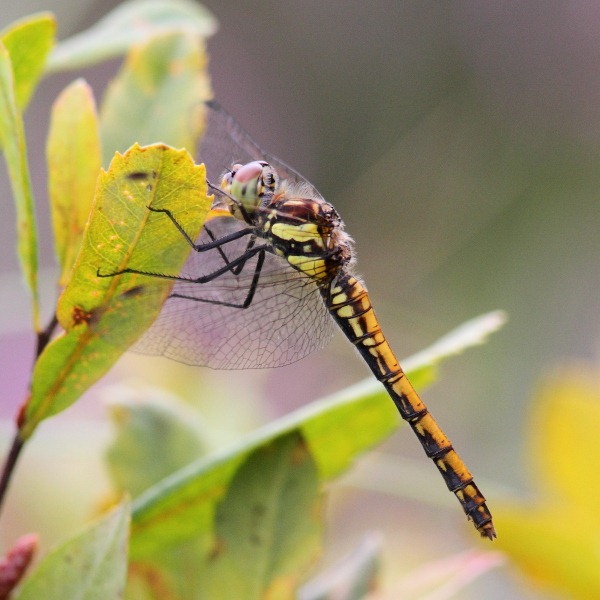 Our mental end goal was yet another RSPB reserve at Glenborrodale where, supposedly, we might be lucky enough to glimpse our first Highland Darter, Sympetrum (striolatum) nigrescens. 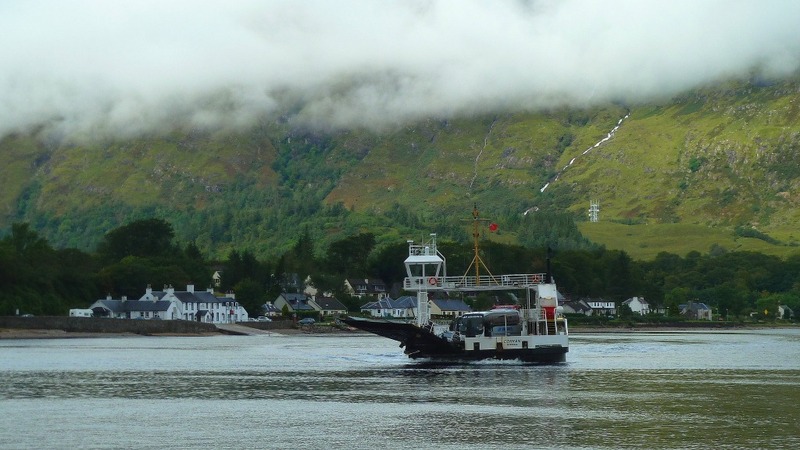 Getting to the other side of Loch Linnhe looked like fun since it involved the Corran ferry, the port being less than a mile from our campsite. The ferry saves a 50-mile or so drive around the end of the loch so we didn’t mind putting the £7.00 fare into local hands rather than the hands of the money-grabbing oil companies. The journey, including loading, crossing and unloading, takes up to 20 minutes. The ferry is a strange looking affair and is clearly purpose built with its loading ramps sticking out at about 45° at either end. This design makes the boat looked curved. We drove on and of at the required wacky angle and were on our way. 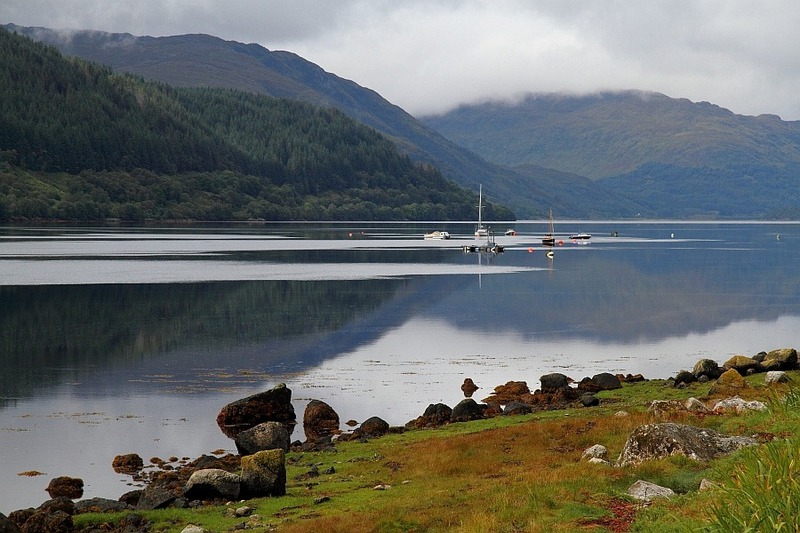 The next stage of our route took us along Glen Tabert and beside another sea loch, Loch Sunart, which, given a little subdued light, even if no sun, looked satisfyingly picturesque with small white buildings nestling in the shores and boats resting at anchor. At Strontian, which gave its name to the element Strontium when it was first discovered there, the road became a single track with passing places. Most folks were good about driving cautiously and using the passing places intelligently. Progress is naturally slow on such a road but we eventually covered the distance to Glenborrodale and, having forgotten to bring the RSPB book [brilliant! ], even managed to find the RSPB reserve. Given the persistent rain in this neck of the woods, conditions were v. muddy underfoot. We climbed up and saw hardly any wee beasties moving at all, far less any dragonflies. Having reached the high point, I’d all but given up when, on a short section of boardwalk, I was definitely flown at. We needed some serious flushing and stalking techniques but a lone dragonfly eventually settled in an accessible position; a female and here she is. I initially thought she was a Black Darter (Sympetrum danae) but it lacks the diagnostic black triangle atop the thorax and I’m now pretty sure this is my sought after Highland Darter, though I’ll need to get that confirmed. The day’s rain began as we arrived back at the car so we abandoned our original itinerary and returned the way we’d come. Swarms of motorcycles – we must have seen 50+ – were outbound while we were inbound. Although a motorcycle with panniers is over half the width of a car – I know ‘cos I used to ride them – for some reason these numbskulls generally didn’t think it necessary to pause in the passing places, they just forced their way through and, at one point, forced my near side wheels off the road taking avoiding action. Curiously foolhardy, considering their vulnerability, I thought. There were two other dipsticks on the road in the shape of two white van men – builders in a rush. Whilst the road had a 60 limit, I thought 55 was sufficient given the frequent bends but Messrs Dickhead and Plonker chose to overtake approaching some of the blind bends and blast on ahead. Fortunately, they didn’t meet any more of the swarming motorcyclists – that would have created an interesting game of chicken. We met them waiting in the queue for the Corran ferry where they had to wait for another five minutes. Interesting mentality. We invested another £7.00 in a pleasantly unrushed return ferry crossing.